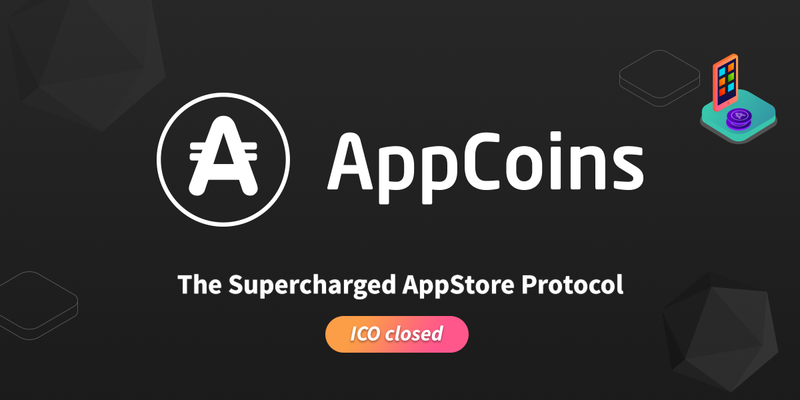 AppCoins ICO is Closed— Hardcap Reached! The day we have all anticipated for is finally here, and we couldn’t be happier to announce that our token sale was a success. The hard cap was reached yesterday, thanks to over 3000 backers. Exceeding all expectations, the amount was raised after only 7 short, very busy days, much before the scheduled end date of the token sale! The reason for the success of AppCoins is mainly due to the support and trust of our incredible community and of, course, due to everyone who contributed with their funds. The end of a successful ICO means that the protocol will be implemented. This doesn’t mean that development only starts now: there is already a working MVP. Check out what our dev team has been working on GitHub. The path to getting here was both exciting and challenging and we thought it would be important to share all of the important landmarks that have brought us to this day. Similarly to the blockchain, we wanted to make this sale the most transparent as possible, hence why we’ve included a transaction wrap-up per day. 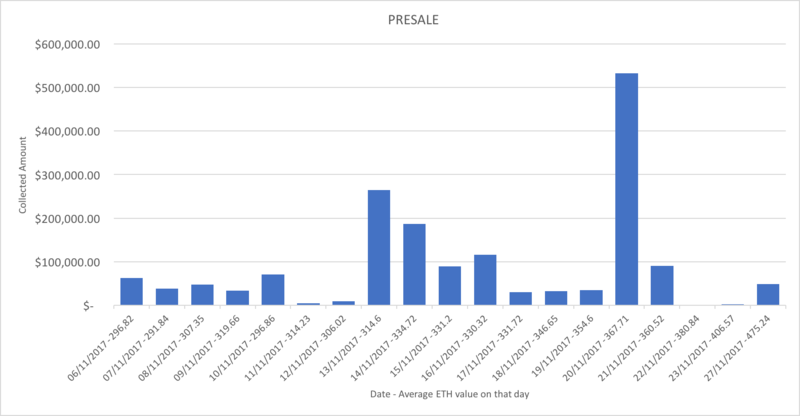 The daily value was calculated based on average Ether price (in dollars) of each specific day of the sale duration. Main ICO Sale Results show that the last day of the sale was indeed the day in which we raised most of the funds. We had three different wallets made available during the different stages of the sale. The fist stage of the AppCoins sale, also known as pre-sale, was a whitelisted-only sale, and it had a specific wallet1 open exclusively to eligible investors in the Aptoide Community. It lasted 2 weeks and welcomed investors from all corners of the world. Having only lasted 2 weeks, the ICO pre-sale raised a whopping $1,554M USD surpassing all our pre-sale ICO goals. The pre-sale offered a 20% discount and the amount raised was used for Marketing efforts and new hires of key team members to the development and implementation of AppCoins. By strategic partners demand, from 21/11 to 27/11, we held a private sale, in which only private investors where able to contribute. The ICO main sale can be seen in the wallet2, which began on December 13th, and lasted for less than 7 days, and allowed all participants to receive a 20% bonus. This bonus was available during the first 7 days of the sale to reward investors who decided to invest rather sooner than later. Besides our other 2 wallets, we also had what we called the Whale Sale3 wallet meant to allow strategic partners to invest through a direct link. Cryptocurrency exchanges: Just like other ICO’s we would also like to give others an opportunity to take part in this amazing project — that’s why we are excited to announce that our team is working on getting APPC tokens listed on exchanges, so that anyone can have the chance to securely purchase tokens, even after the ICO. Stay tuned as we will be announcing this shortly. Unlock of Token: We’re currently analysing all the data and double checking the smart contracts to make sure everything is in order. We will be announcing more about this soon, so stay tuned. Updates: We will be posting the developments our team is working on, and every two weeks there will be a detailed announcement on everything we’re doing to implement AppCoins into production. Withdraw Funds: In order to preserve the value of the token and to mitigate the risk of coin flutuactions, we will convert between 50% to 70% ETH to fiat currency in the next three months. Our Telegram is still open to the community of AppCoins enthusiasts. Join a community of over 5,000 members worldwide. We would also like you to know that we are still analyzing results and we will keep you updated with all of the important information in the next few days! In conclusion we would like to thank, once again, everyone who helped the ICO project come true! A big thank you for your support! Aptoide was founded in 2011 and has its HQ in Europe and offices in Singapore and Shenzhen. With over 200 million users, 1 million apps and 4 billion downloads to date, Aptoide is a community based platform that reinvents the app discovery experience through a social environment, tailored recommendations and the opportunity for users to create and share their own playlist of favourite applications and games. AppCoins is a new cryptocurrency that all Aptoide users can earn and spend inside app stores. Once the protocol is implemented, AppCoins can be adopted by any app store, regardless of the operating system. The protocol creates a new shared ecosystem among all app stores, powered by the blockchain. AppCoins is to become the new universal language of the global app economy.